If you want to update your décor in a hurry, there's nothing as effective as sewing your own pillow covers. This affordable project is easy for seamstresses of any experience level, and it provides endless opportunities for expressing your personal creative style. You don't need to run out and buy new pillows to decorate your sofa or bed. Instead, you can sew new covers for your existing pillows. It's simple to add a zipper to your covers to make them easy to change when the mood strikes you. Expect to spend about an hour making a cute throw pillow cover. Begin by measuring your pillow at the widest point in each direction. If you have a square pillow, these measurements will be the same. If you're using a purchased pillow form, the dimensions will be printed on the package. Add two inches to each dimension for seams. Spread the fabric out, and cut out two pieces that match your measurements from Step 1. Remember to add two inches to accommodate seams and a zipper. If you'll be using piping, baste it onto one piece of the fabric using your zipper foot. Make sure both raw ends are tucked back so they won't show when you assemble the pillow. Remove the zipper from the package, and iron it to get rid of any creases. Place the right sides of the fabric together, and sew a seam along one side. Allow for a one-inch seam. Use your iron to press this seam open. Pin the zipper in place along the wrong side of the seam. Use your sewing machine's zipper foot to sew both sides of the zipper. When the zipper is in place, use a seam ripper to open the seam. Unzip the zipper. Place the right sides of the pillow fabric together, and pin the edges. Sew the remaining three edges, and turn the pillow cover right side out. Use the iron to remove any creases. Then insert your existing pillow or pillow form, and zip the side closed. Your pillow is done! Decorative piping can really make a pillow cover special, but it can seem intimidating to new seamstresses. If you can't find a pre-made piping you like at your fabric store, you can easily make your own to use in your pillow cover. Simply cut the desired fabric on the bias, or diagonally, to create a strip that is about three inches wide. Place a piece of cotton cord in the middle of the fabric, and fold the fabric around the cord. Use your sewing machine's zipper foot to sew the fabric closed around the cord. Finally, trim off any excess fabric and use your piping to decorate your pillow cover. Pick two large, fun buttons and created a tufted pillow by sewing them to the center of your pillow. Start by securely attaching embroidery floss or strong quilting thread to one button and then sewing through the middle of the pillow to attach to the other button. Vintage buttons can give your pillow a unique look. Create a modern appliqué from another piece of fabric. Consider cutting out a large bird, flower, or other fun shape from a large print. Cut about ¼ inch from the edge of the shape, and then pin the shape to the front of your pillow before you assemble it. Sew around the edges with the sewing machine, leaving the raw side out. Instead of using piping to edge your pillow, make a ruffle out of a complementary fabric. To do this, cut a strip of fabric that is four inches wide, and fold it in half lengthwise. Use your iron to press the fold. Then sew along the raw edge with large stitches, and gather the stitches to make your ruffle. 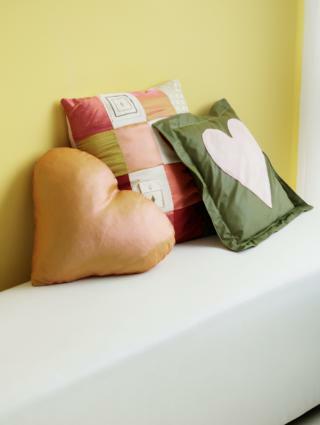 Paint a stencil on the front of your pillow using fabric paints. Choose the shape you want, and purchase the desired color of paint. Tape the stencil to the fabric so it won't move around, and use a stencil brush to create the design. This is a great way to add a holiday motif to simple pillow covers. Instead of sewing a zipper into your pillow cover, create a button closure. To do this, cut the back portion of the pillow cover so that the fabric overlaps in two pieces. Finish the edges of both pieces, and then sew buttonholes on the top piece. Sew decorative buttons to the corresponding area on the bottom piece. Because they don't use very much fabric, pillow covers are an affordable project no matter what your sewing budget. You can even remake existing items from the thrift store to create unique, environmentally-friendly designs. With the unlimited options when it comes to fabrics, embellishments, and shapes, sewing your own pillow covers is a great way to refresh your décor and express your personal style.